As a building along McCord Street in Tunkhannock is pulled down behind them, a number of individuals who worked together to fund the buyouts and demolition of flood-prone properties in the borough gathered on Wednesday morning to see the fruits of their labor. Participants included (from left) Rep. Karen Boback; Eileen Spencer, representing Rep. Sandra Majors; Sen. Lisa Baker; Wyoming County Commissioners Ron Williams, Tom Henry, and Judy Mead; Mayor Norm Ball; Pat Rogan, representing Cong. Lou Barletta, Wyoming County EMA Deputy Director Dave Carichner, EMA Administrative Assistant Sue Howell; EMA Director Gene Dziak; Tunkhannock Borough Council President Stacy Hubert; Robert Jones of Smart Recycling, CECO Engineering Structural Coordinator Eric Speicher, Wyoming County EMA Task Force Planner Keith Howard; and CECO Project Engineer Reade Schields. It has taken well over two years and representatives from multiple layers of government to bring plans to fruition to buyout and demolish approximately 40 flood-prone homes in Wyoming County. 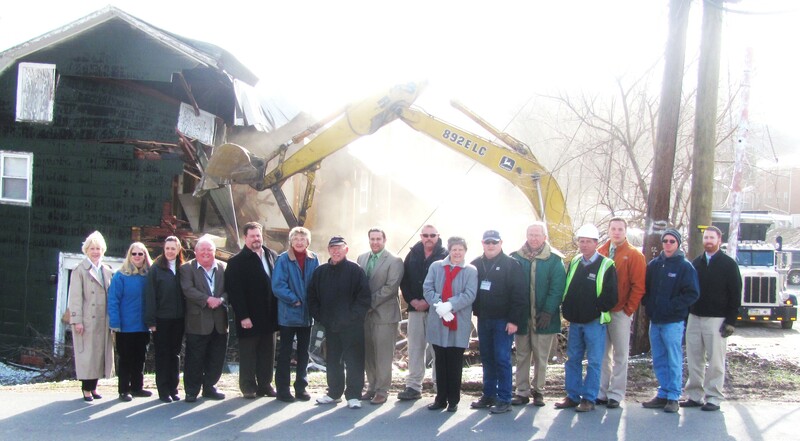 On April 16, state, county, federal, and local elected officials and other representatives gathered on McCord Street to witness the demolition of a large warehouse that was badly damaged by waters from Swale Brook, Tunkhannock Creek, and the Susquehanna River in 2011. 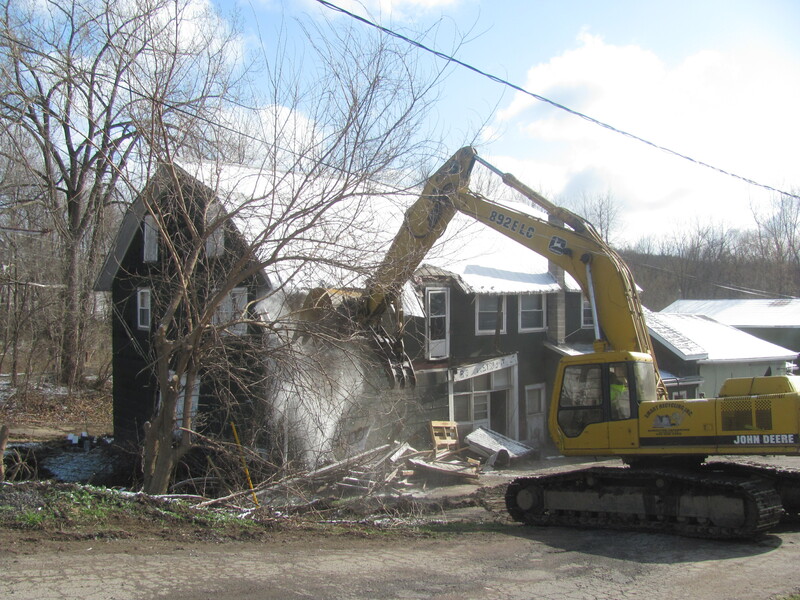 “It was an opportunity for the representatives of the agencies to see that the demolition of destroyed homes in Wyoming County has begun,” said Wyoming County EMA Director Gene Dziak. It wasn’t difficult determining which properties were most at-risk for repeated flooding, Dziak explained, and assistance from federal and state disaster funds was available. But the acquisitions were still daunting. “There have been a whole array of situations that we are dealing with that have lead us to have to buy them out one at a time,” Dziak said, citing second appraisals, liens against properties, and mineral rights contracts signed in recent years as some of the obstacles. “You have to go through the same process as if you were buying it,” noted Tunkhannock Mayor Norm Ball. Some landowners surrendered their gas leases, which allowed for the buyouts to progress, but the leases are still in limbo because municipalities cannot profit from the property and therefore cannot retain the mineral rights by default. One of the early catalysts to turning the tide and getting the buyouts moving was the decision by leaders of individual municipalities to let the county take the lead. Borough officials had already met with owners of flooded homes to get them signed up with FEMA, but Ball agreed that it made sense to follow the county’s plan and avoid unnecessary duplication of applications and fees. The three county commissioners supported the idea, and Dziak began blazing a more effective trail to state and federal officials and secured the assistance of some key figures. With the support of so many elected officials and the funding in place, county officials solicited the help of CECO Engineering, which conducted bidding for demolition teams – like Smart Recycling of Dunmore – and will handle the projects across the county on behalf of Wyoming County EMA. Ball concedes that the buyouts resulted in a loss of property taxes that the borough cannot recover. Most importantly, however, he noted, “We no longer have to worry about the people down there being being flooded.” Ball recounted dramatic rescues of residents in previous years from the swift moving waters of Swale Brook and Tunkhannock Creek. Dziak noted that the properties, once cleared and seeded, can never again be the site of a permanent structure.